It’s amazing in life how one idea can change everything. Four years ago I was struggling with wanting to be a writer, yet was finding it difficult to actually get my thoughts and stories down on paper. So I started this blog with the plan of writing a one-page story every day for a year. Now I only got to 270 stories, but it was refreshing to be writing something creative every single day. Since then, I’ve written online more sporadically than I would like, but that’s due to a project that just took off from that one idea to write every day. One of the short stories I wrote in 2010 was about an actress who had just gotten hired to be on a new TV drama that was a also a reality competition. Trolls for Dust was the name that popped into my head, and I just couldn’t let that story go. And now I am writing the second book in the series Trolls for Dust and working on advertising the publication of the first book. 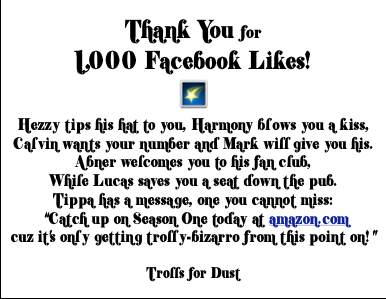 As of today the Facebook page for Trolls for Dust has reached over 1,000 likes, something I know isn’t that uncommon, yet it took time and dollars to get it to that point. I’ve had so much fun not only self-publishing and creating the story and the series, but also letting my creativity loose a little in coming up with “box” ads. Now there may t-shirts coming in the future and the website itself is presenting more potential, and the second book is looking to surpass the first in both quality, drama, and awesomeness. 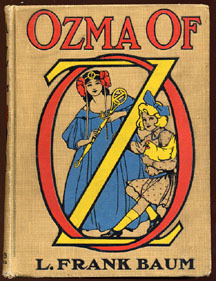 Also, I have the privilege of giving away books to potential readers on goodreads.com and am looking into selling the print edition at a book fair or two. I wanted to share this today, just to encourage the pursuit of ideas, especially for the writers out there. One good idea can change your life. It can open doors you never knew existed. I’m writing more now than I ever have before and a blank page no longer scares me, but intrigues me. I’m having fun pursuing a dream that, yes, is leaving a bit of a dent in my bank account, but is so much better than sitting around and thinking, “I wish…” And I’m learning about publishing, advertising, marketing, design, and writing along the way. It’s getting to be that time of year again: swimsuit season. And I think to myself, I should really start getting in shape. Don’t want to scare away all of my nieces and nephews at our family reunion in a month (None of whom are over the age of ten). Don’t want to scare away the rest of my family either…or the fish. Am I being too dramatic? Welcome to modern times where drama seeps into everything, especially our appearance. The sight of a woman’s natural, hairy legs and/or armpits can send people into conniptions. To not shave is practically a sin in American society. Some people don’t feel like themselves without makeup caked on and their hair dyed and coiffed. And too many of us currently spend our days trying to prevent our bodies from aging by any means necessary: injections, surgeries, exhausting exercise and diet regimens. I’m saying this not to judge, but to point out, hey, what are we doing with our lives? Being physically young and healthy is pretty awesome. At least, I think it must be, but my experience wasn’t exactly that. My body’s had problems from day one, likely because I was in such a hurry to get into the world already. Premature, on time, or late, not all babies come into the world in perfect health. Some of them struggle throughout their childhood with being physically different or unhealthy. So that begs the question, does our happiness really lie in being perceived–either by ourselves or others–as young and healthy? For me, trying to work at an ideal of youth or beauty in my physical appearance doesn’t match up with what I actually experienced. If we think about it, this is probably true for a lot of us. Are we trying to reach our lost youth where we worried about the latest zit that sprouted on our chin? Or about being underweight for our age group? Or overweight? When our teeth were so crooked we had to wear braces? Exactly whose fantasy are we trying to get back to? It’s not a wonder our body image is low when we are trying to attain not our own lost youth and health, but a magazine model’s, or a movie star’s. Talk about impossible goals. And that doesn’t even include our quest for the “healthy” perfect diet. Diet trends probably do address problems that are true for some people. Some people eat too many carbs and not enough protein. Some people don’t eat their fruits and veggies. Some have a genuine allergic reaction to grains and wheats. How do we go from that to: Everyone everywhere should reduce their carb intake, everyone should buy a super cool really expensive juicer (instead of eating more fruits and vegetables), everyone should eliminate all wheat from their diet. And the list goes on and on. Why are we following these diets? Is it really because we have genuine interest in good health or is it because we want to sound and look smart? Do we honestly understand the “science” behind these trends? And what about all the people who smoke, drink, eat what they want, don’t exercise, and live to be 98? Every time I start fixating on my appearance or bemoaning the new aches, pains, and wrinkles that appear as I age, I tell myself to think about this passage. Eating the correct foods or sticking to the correct exercise regimen might make me physically healthier and my body more pleasing to the eye. But do they really make me a better person? Not really. In fact, sometimes being a health nut has the opposite effect. We become cultists who nag our fellow human beings on their salt intake, fat intake, their flab or lack thereof, etc. I once knew a woman who could tell me the exactly amount of calories in whatever I was eating for lunch. I didn’t think of this as a great gift, but a burden: How could she ever just enjoy eating being so fixated on losing weight? What comes out of the mouth defiles a person. What comes out. What we say, how we say it, how we treat people, how we honor or dishonor God, these are the important things. If someone comes up with a cure for cancer, are we really going to care how they look in a swimsuit? And we already know this. I already know this. But it’s so easy to forget in this day and age of airbrushing and people who spend almost all of their time looking good. So, what’s my body image? It changes by the day, sometimes by the hour, depending on the time of month. If I think I look good, I act far better than if I think I look like a mutant from the planet Flaffluga. So how do I attempt to keep a positive body image 24-7? For me, it’s a matter of faith. I believe that I was created specifically for two purposes: To love God, and to love my fellow man. My Creator loves me just the way I am, even though in this sinful world, my image and my actions will never be perfect. He doesn’t love my flaws, but loves me despite my flaws. He loves me so much that He doesn’t want me to live in anger, resentment, and pride, but to live free of all that. We put so much emphasis on physical appearance, but none of our ideas about the afterlife from any religion talk about physical beauty. People are judged by what they do, not how they look. In Christianity, even that is swept aside by the declaration that we can never be good enough to satisfy the law. Thus, Our Savior Jesus took our place and lived a perfect life to save us. Back to swimsuits. I find the less skin I reveal, the better I feel and the more I can focus on having fun and making sure those around me are having a good time too. And the days I remember God’s love (and it’s so easy to forget), those are the days, those are the times where what comes out of my mouth is sweet, caring, and uplifting. Those are the days I focus on living, not on looking in the mirror. Trolls for Dust, S1 print edition now on sale at Amazon. 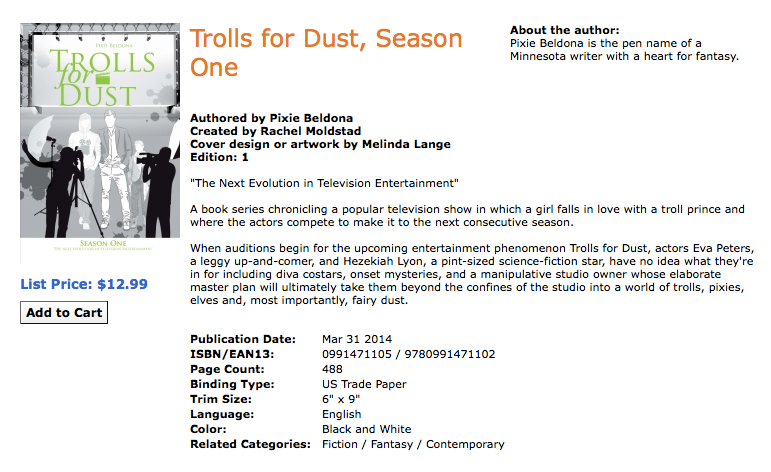 Trolls for Dust, Season One print edition now on sale! The TfD, S1 print edition is finally here! Sold currently at the Create Space estore and soon to be on Amazon.